Beautiful Incentives: It's flu season! 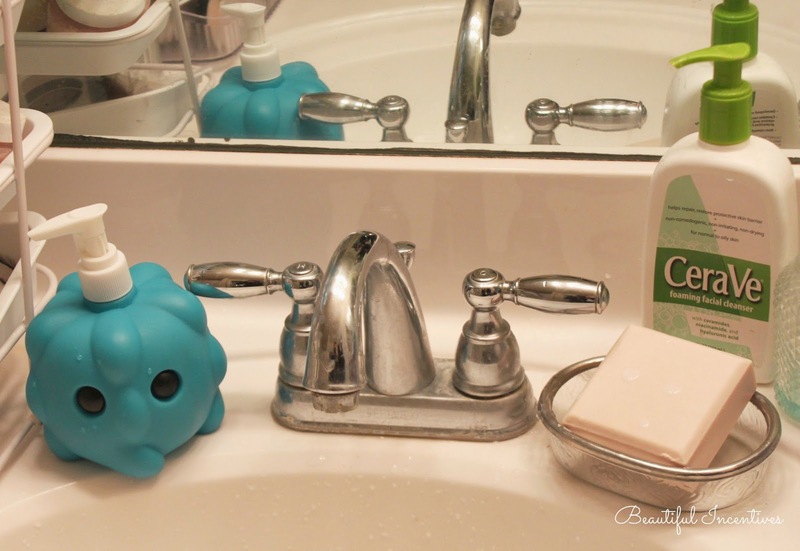 Avoid germs with #GiantMicrobe reminders! It's flu season! Avoid germs with #GiantMicrobe reminders! It's about that time again when everyone goes back to school or their jobs or they're around a ton of people during the holidays. The time when people get a little too close for comfort. The germs are a flying and it's a crap shoot where they'll land, but your chances of getting sick are much higher when you don't wash your hands, you can be sure. Introducing Giant Microbes! The cute cuddly versions of gross bacteria and germs. These are hard to stay away from and can serve as daily reminders to keep clean and avoid the real things. Especially great for children. It's a fun way to teach them to stay clean and have fun doing it! The 3 Giant Microbes you see here are: The Common Cold, White Blood Cell and The Flu. The Common Cold and Flu is to remind you what you don't want and the white blood cell is to remind you that it's fighting for you in the unfortunate event you do get the sickies. Cuddle up with it and your chicken soup and sleep the sick away. My favorite product of theirs is the Giant Microbe Common cold hand wash pump. This is perfect for your home or stores. I wish they'd put them in store bathrooms. It might prevent a lot of sickness! It's easy to use like any other and easy to keep clean. Just fill it with your favorite germ fighting soap and pump away when needed. It's cute design is going to have a hard time not getting your attention or your kids! I know it helps me and it's just a fun little piece for your decor. Gentleman, Ladies, be considerate and cover your mouth when you sneeze or cough. Even around things, germs and bacteria can last for hours on surfaces. If you're contagious, stay home if you have a choice! As a friendly and fundamental reminder of all the germs that linger in our world, Giant Microbes is here to help you keep your chances of getting sick lower! I'm such a huge fan of these little guys! Also, you MUST check out my review on their Giant Microbe Christmas ornaments. They have so many unique gift ideas! 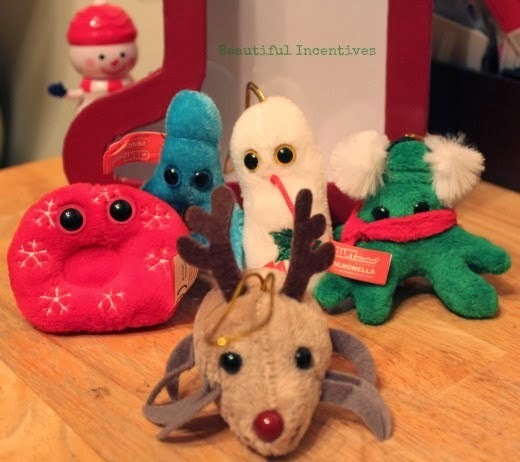 The lovely folks at Giant Microbes want to help you stay well this season with the same gift pack reviewed today. 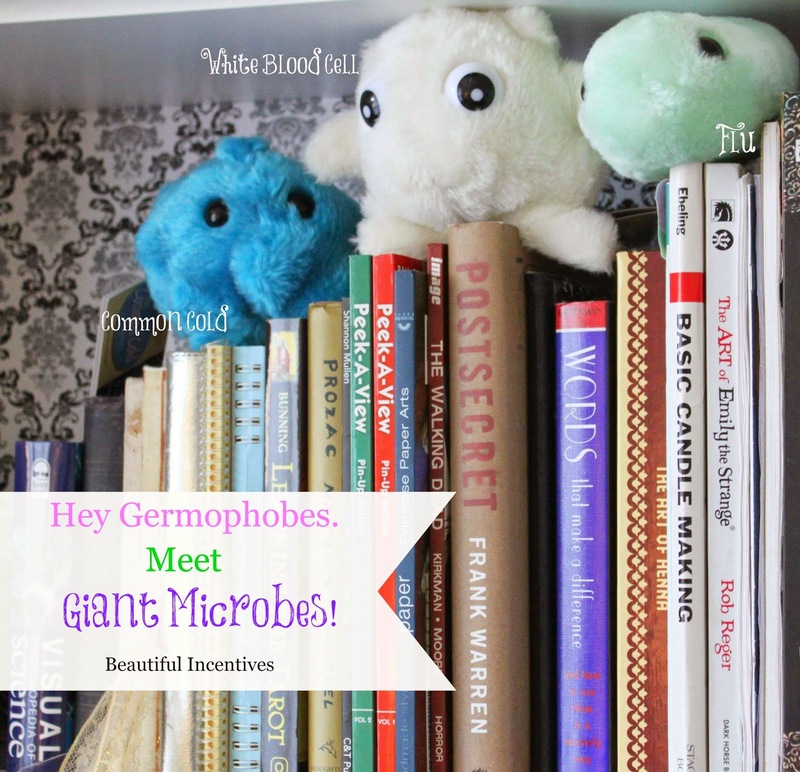 3 Giant Microbe plushies and a hand wash pump! One lucky winner will receive the bunch. Good Luck and happy sick-free Holidays! USA & CANADA are eligible! *Must* leave a blog comment to be eligible! This giveaway and review is in accordance with FCC guidelines. Beautiful Incentives and all bloggers promoting this are not responsible for fulfillment of prize. This post may contain affiliate links through which I get a small percentage of purchases. Thank you for the help. I like the white blood cell. I like the bed bugs. I think the kissing disease is the cutest doll. The actual disease, not so much. The red blood cell. SO CUTE. The common cold is adorable!